The Hotel Europe Villas Cortés G.L. and Spa is located right on the beach in Playas de Las Americas. Amenities include restaurants, concierge, swimming pools, Jacuzzi, laundry services, gym, sauna, massage services, currency exchange, sauna, bar, room service.Each room also has some extra perks too, such as Cable TV, a mini bar and a balcony/terrace. Many guests stay in the hotel with nothing but good things to say. Lots of patrons enjoy the quiet setting, making for a relaxing and enjoyable visit. The hotel is also a great meeting place for business due to the quiet environment and relaxed atmosphere. Being so close to the beach also offers guests a place to unwind at the end of the day and take in the beauty. Being located in Playas de Las Americas, the hotel is within walking distance of many fine restaurants and exquisite nightclubs. Guests can be certain that their stay will be enjoyable; with such a relaxing environment stress seems to just melt away. Many returning customers always talk about the quality and comfort of the rooms. Relaxing by the poolside and walking to the beach are always relaxing ways to spend a holiday or business trip. The Hotel Europe Villas Cortés G.L. 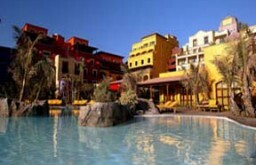 and Spa is a beautiful hotel that is great for business travel and holidays. It offers guests an upscale and modern retreat from normal life, and at a great price.